Of Chesaning, 98, went to his heavenly home on Tuesday, January 15, 2019. Lloyd was born on March 23, 1920 to Albert and Bertha Schmiege. He married Betty Staley of Saginaw on February 10, 1945. Lloyd was a lifelong Christian man whose faith in his Lord Jesus was the most important thing in his life. He was a shepherd during his younger years and won many awards at the state and national levels. 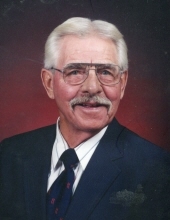 He enjoyed life on the farm and in his later years, he enjoyed raccoon and squirrel hunting with his dogs and mules. He was also employed at Woodards in Owosso. Lloyd is survived by his children, Monte (Eileen) Schmiege of West Bend, Wisconsin, Gloria (Terry) Glowicki of Mayville, Michigan, Timothy (Jan) Schmiege of Big Lake, Alaska, and Arthur (Catherine) Schmiege of Chesaning, Michigan; and his twelve grandchildren and nineteen great-grandchildren. He was preceded in death by his wife, Betty. A funeral service will be held at 3:00pm on Sunday, January 20, 2019 at Christ Lutheran Church in Oakley. Pastor Jeremy Glowicki (grandson) and Pastor David Mielke will officiate. Visitation will be held that day from 1:00pm until the service. Arrangements are entrusted to Nelson-House Funeral Homes Martin Chapel, Chesaning, Michigan. Online condolences may be sent to the family at www.nelson-house.com. To send flowers or a remembrance gift to the family of Lloyd Schmiege, please visit our Tribute Store. "Email Address" would like to share the life celebration of Lloyd Schmiege. Click on the "link" to go to share a favorite memory or leave a condolence message for the family.